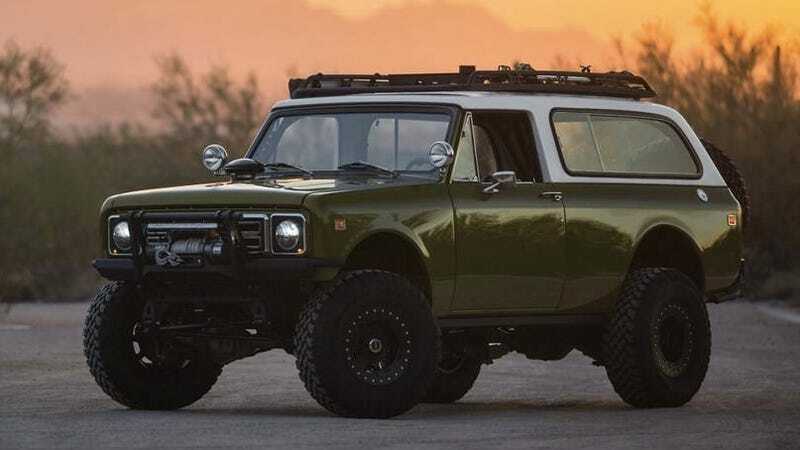 RM Sotheby’s is auctioning this heavily modified 1977 International Scout II Traveler at a huge sale in Arizona, where it’s apparently expected to bring “$70,000 to $90,000.” I think it’s neat because it’s exactly like my truck. Kind of. But also, if that price prediction is accurate, this might be the most expensive Scout yet. Of course, there’s that one we saw listed for $175,000, but it’s pretty much a running joke in the Scout community at this point. Rare, sure. But come on. It resurfaces on various Scout forums and Facebook groups from time to time. Anyway, this green machine has made the rounds now, too. And it made me remember just how nice these rigs can look when somebody attacks one with an unlimited budget. Alright, so this fancy resto-mod rig and my sloth safari truck are really only similar in the sense that they’re both Scout II Travelers with black wheels, oversized tires, swing-out tire carriers, winch bumpers, roof racks and extra lights. And green paint. Which is really just “green” “paint” in my truck’s case. Something tells me the Sotheby’s one isn’t currently leaking anything either, which is another advantage it has on mine. Ah shucks, the more I look at these two vehicles in profile the more I realize they’re barely similar and now I don’t feel nearly as good about myself. Still, as nice as the nicer one is, I don’t think any of us have seen too many $90,000 Scouts before. Even (especially?) if it’s been engine-swapped with a GM 6.0-liter V8 and beefed up with a 4L60E transmission and Dana 300 transfer case. Like so many expensive old trucks, this is almost too pretty. The pièce de résistance is inside, too. Get a load of these aircraft-style gauges. Drool. I’m selfishly curious about what the market decides this truck is really worth, because as we’ve established, it’s basically the big daddy version of my own pet project. But it also seems like an interesting potential turning point in the vintage 4x4 scene, as Scouts are still languishing while Ford Broncos and Toyota FJ40s are starting to hit stratospheric prices in any condition. For example, many Jalopnik readers will be familiar with Jonathan Ward and company’s work at ICON 4x4, where Land Cruisers and Broncos are regularly updated to museum-quality derivative builds. His vehicles, which are really on a whole other level above “restomod”, sell for $200,000 and more. (Much more.) But Ward has told me, several times, he can’t make money on Scouts and has yet to build one. I’ve seen plenty of modified Scouts before, and clean ones. But this green one is one of the few earnest, complete-looking, retro-style/modern-power Scouts I’ve come across and I can’t wait to see if it kicks off a trend of more people reviving International Harvesters. Cursory research indicates somebody’s already on the case: this outfit New Legends 4x4 is already all over it! Hopefully I still have enough time to buy two more Scouts before the prices get too out of hand. I still need an early 80/800 style and a standard wheelbase Scout II to complete my set! Scout the America others pass by.